In the EMK 1 measuring chamber, calibration grid measurements can be carried out on 1" and 1/2" Microtech Gefell GmbH measuring microphone capsules in normal working rooms. Due to its solid construction, the EMK 1 attenuates external noise by approx. 40 dB. The measuring chamber consists of the removable upper part and the fixed lower part. The acoustic calibrator 4010 is an acoustic Sound source for calibration and testing of Sound level meters. It can generate 2 different sound pressure levels with 2 different frequencies, which can be used to check the level linearity and frequency weighting of sound level meters. Furthermore, the ambient conditions temperature, air pressure and relative humidity are measured. Before switching on the calibrator, a measuring microphone must be inserted into the coupler. After the calibrator has been switched on a loudspeaker in the coupler generates a sinusoidal sound signal with a frequency of 1 kHz and a sound pressure level of 94, 0 dB. The sound pressure level is measured with an internal reference sensor and readjusted. This results in a sound pressure level that is the acoustic load of the measuring microphone and of the ambient conditions within the specified operating conditions of virtually independent sound pressure levels in the coupler of the calibrator. A correct sound pressure level is achieved by changing the color of the LED is displayed from red to green The acoustic calibrator 4011 (without display) generates a sinusoidal sound signal with a frequency of 1 kHz and a sound pressure level of 114, 0 dB. The Pistonfon 5002 is a small, network-independent precision sound source of class 1L according to DIN IEC 942 (1990) for fast and accurate calibration of sound level meters and complete acoustic measuring stations. It is easy to use and quickly ready for operation. The instrument requires only a small Maintenance effort. The Pistonfon 5002 can be used to measure microphones with a capsule diameter of 1", 1/2" and 1/4". For 1/2" and 1/4" measuring capsules corresponding adapter rings are used, which are included in the scope of delivery. Apart from measuring microphone capsules from the Microtech Gefell product range, other manufacturers can also be calibrated if they have the same diameter. Deviating load volumes must be taken into account by a correction factor. 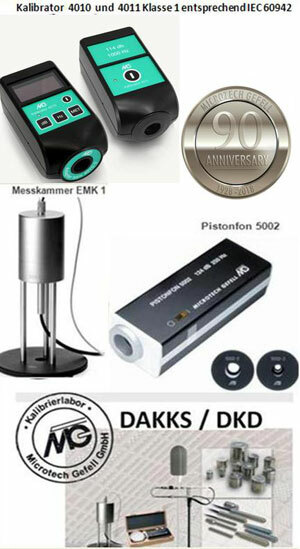 The mentioned devices are also used in the factory's own, DAkkS-accredited calibration laboratory. The DAkkS accreditation (Deutsche Akkreditierungsstelle GmbH ) certifies that the accredited bodies perform their tasks competently and in accordance with applicable requirements. Microtech Gefell GmbH calibrates the physical quantities sound pressure and vibration. The measurement standards for sound pressure and reference microphones are traceable.to PTB standards (Physikalisch Technische Bundesanstalt). The measurement standards for acceleration and Reference acceleration sensors are traceable to DKD standards (German Calibration Service).